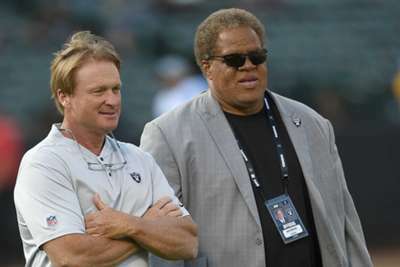 The Oakland Raiders have fired general manager Reggie McKenzie, the team announced on Monday. McKenzie had served in the role since 2012 but leaves during a difficult season, the Raiders holding a league-worst 3-10 record despite Sunday's surprise 24-21 victory over the Pittsburgh Steelers. Oakland thanked the 55-year-old - a linebacker in his playing days who was drafted by the franchise in 1985 when they were based in Los Angeles - in a short statement. "We are grateful for everything Reggie has done for this organisation as a player, executive and member of the Raider family," the statement read. "We wish the best for Reggie, June and the entire McKenzie family. "The Raiders will immediately begin a search for a new front office executive and will have no further comment until that process is complete." According to reports, McKenzie held a meeting with his scouts earlier on Monday and informed them he had been dismissed. The Raiders, who are scheduled to move to Las Vegas in 2020, hold five first-round picks over the next two years. They appointed Jon Gruden as head coach for a second time in January, having previously served in the role from 1998 until 2001 before he was traded to the Tampa Bay Buccaneers.